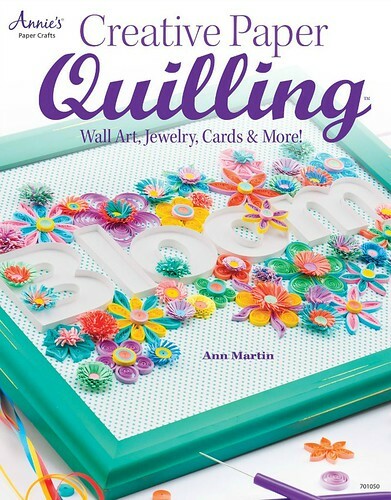 Creative Paper Quilling: Wall Art, Jewelry, Cards & More is a new book I completed this past summer along with the editor of CardMaker Magazine, Tanya Fox. Tanya and I first worked together on Quill It Easy in 2008 and I was pleased when she asked if I would like to do another quilling title. The book is filled with fresh ideas and appealing designs that range from cute to classy, perfect for those who are brand new to paper rolling as well as seasoned pros. I created jewelry, an ornament, and card designs for the book (such as the three examples you see below) and you'll also find framed art and home decor projects. The official blurb: Creative Paper Quilling contains 28 brand new and exciting quilled designs. Join Ann Martin and other accomplished quilling artists as they share expert technique information, helpful tips and eye-catching designs that are sure to appeal to crafters of all skill levels. Enjoy creating greeting cards for a variety of occasions, charming ornaments for your favorite holidays, stylish jewelry pieces to enhance your wardrobe, and unique wall art and home accents. The Quilling Basics chapter equips readers with sufficient knowledge of supplies and tools to get them started. The Shape Gallery includes images of the quilled shapes used in the book and provides instructions and step-by-step details needed to create each shape. 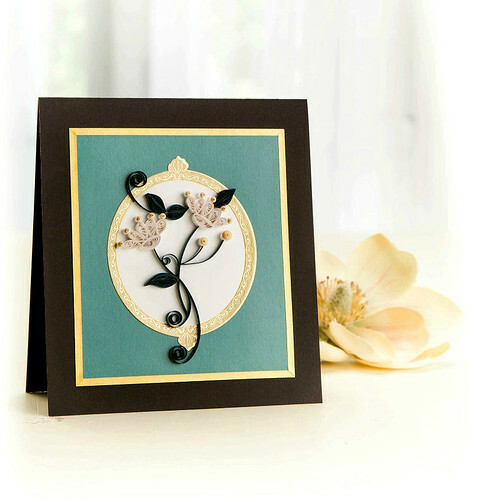 Creative Paper Quilling is available as a paperback or digital download. And now onward to the last hop stop - CardMaker, where you will find the full list of participants [edit: no longer available]. Wow, Ann! Congratulations on the new book. The cover project is gorgeous (love the bright, happy colors) and I cannot wait to get it. I am so excited for you! Thanks Molly! I love Sandy's Bloom project too - Tanya made the perfect choice for the cover. Whoa! 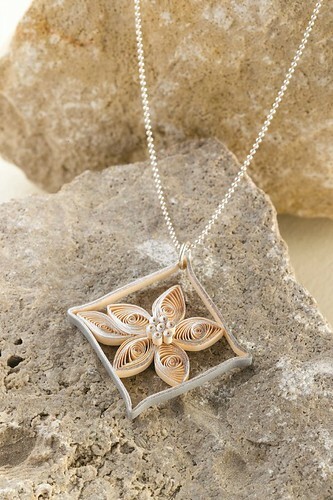 These are all stunning, and that pendant is exquisite, that makes me want to try quilling! Hugs, blessings and congrats on your new book, Ann! Aw thanks Deborah! You can take a peek at lots more of the projects via the book title link. Congratulations! The designs are really beautiful. The jewelry is stunning. Hello Ann, Your work is always so beautiful and classy. Am truly honored to have been a part of this amazing book with such talented Artists. I always see so many beautiful things with you it's steets enjoy again! Congrats on the new book Ann. 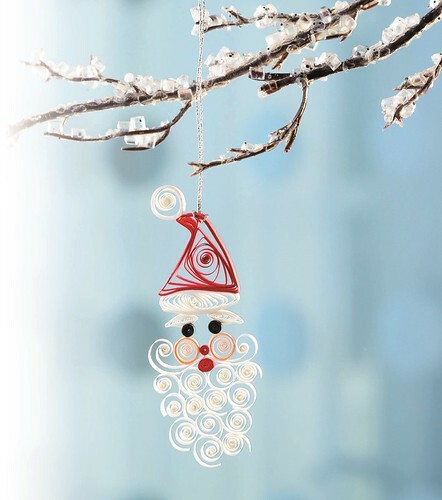 Love the clever snow man ornament, Your quilling is always so stylish. I am sure it is a great book . beautiful work as always! congrats on the book! Great inspiration for new quilling projects. Your necklace, Santa and card are so delicate and beautiful. Congratulations on having your creations in this fun book! WOW! What wonderful projects. They are amazing. Can't wait to order this book. Congrats! You're amazing, Ann! Looks like a beautiful book! I just pinned it to my Quilling board on Pinterest. Oh Ann, your projects are fantastic! What a wonderful opportunity, I am so happy for you! Congrats on another book! It looks delightful. I haven't been very tuned in to anything in the paper arts world, so it was a huge delight to discover your growing list of published work! So proud of all you have accomplished in bringing the paper arts, particularly paper filigree, some well deserved recognition! Miss our days of creative synergy and design troubleshooting and frequent chats.